Beautiful - wonderful - story about nature, survival, and an unlikely, extraordinary fifteen year old heroine. Best writing about nature I've come across, and a masterclass in writing character. Where's the jacket here? A beautiful and unusual novel. Vividly portraying the way people and place can hold together just as they fall apart. Beatty has a profound understanding of nature and of people too. There are so many ways that this might have gone wrong and it didn't. We are told on the back cover that there will be a tragedy, but we are kept gently on guard throughout, never really knowing if it is coming or has already happened - which is a lot like life. It's a long time since I was so emotionally charged after finishing a book. What a clever use of descriptive language this author used.She also managed to entwine the live of Ann with the life of the forest in an incredibly creative way. It may be that a 15 year old girl would not be allowed to just disappear into the woods and not be looked for by someone (even if only social services), but that is just poetic license maybe. However, she just didn't fit in with her family and did what lots of people do and just left. There are many 'bag ladies' around (and gentlemen), who just don't fit in what is seen as 'normal'. This book just shows that falling in love, needing friendships and caring for your surroundings are the province of everyone, even those who are from 'la-la land'. I didn't find this a particularly easy read but I think the subject matter will stay with me. Anne leaves her family at the age of 15 and they seem to ignore the fact that she has gone. She has a sister with whom she does not get on with, who seems quite disagreeable but then if your sister left home and became a 'bag lady' .......... Anne's relationships are all rather strange.The natural aspect of the story is a major part. Urban encroaching on rural.All in all very interesting - one that will pull at the heart strings. 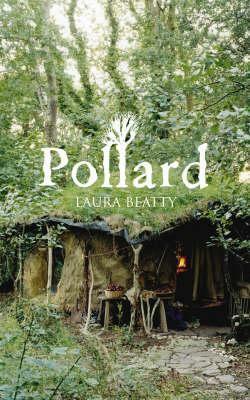 Pollard is the back story of a 'homeless' woman named Anne, who runs away from home when she's 15 and goes to live into the woods. She becomes completely self-sufficient, growing veg, hunting and cooking animals and building her own house complete with stove. But the outside world won't stay away for ever, and the book tells the story of how she attempts to both hide from 'real life' and to make human connections. It's a beautiful book, lyrically written, and quite sad... in a nice way. This book is both heartbreaking and beautiful. I'm still thinking about it. It's about a misfit teenage girl who escapes her dysfunctional family to go and live on her own in the local wood. She becomes a outcast to society. The fragile human relationships she forms are in contrast to her growing understanding of her natural environment and make for some incredibly poignant moments.Just read it please and form your own opinion. Quite a weird one. A 15 year old just decides one day she'll leave her family house and go live in the nearby woods. They don't even look for her, and so she builds herself a hut in the forest, living off both the refuse of others and her own forest scrounging. Her endurance and the few relationships she makes with locals are interesting food for thought. Exceedingly strange book. Certainly different. It grew on me (ha ha) and I ended up rather liking the "heroine". Intriguing realisation of the way in which a person could literally live off the land in this day and age. possibly the most moving book i have ever read. her desciptions of the beauty of the unfolding seasons are perfect.